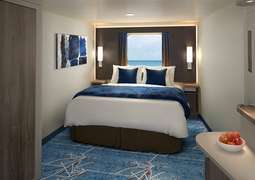 If you’ve ever imagined cruising Alaska and the Caribbean in true style and comfort, a trip on Norwegian Bliss is for you. 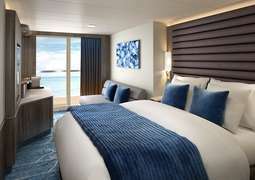 Launched in 2018, she's the newest and largest ship in the Norwegian Cruise Line fleet. Enjoy spectacular views on the quarter mile wraparound promenade, or speed along the ocean’s longest racetrack. Dine al fresco in one of the ship’s classy venues, or sample some of Dolce Gelato’s ice cream, freshly made onboard. The kids will love splashing around at the aqua park, and the two multi-story slides make Norwegian Bliss a firm family favorite. But if you’re in need of pampering, there’s only one thing to do: head to the Mandala Spa, with its thermal suite and massage therapies. The Norwegian Cruise Line prides itself on combining high standards and stylish dining options with a modern outlook. 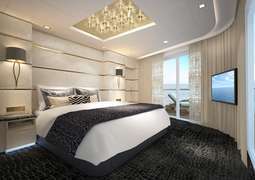 Offering unbeatable prices for solo travelers and world-class entertainment, Norwegian Bliss offers the experience of a first-class hotel while sailing the ocean. Boasting exciting excursions on shore for each destination, the Norwegian Cruise Line makes for an unforgettable vacation. 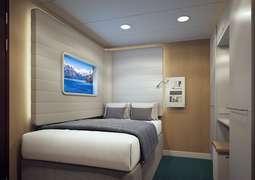 Solitary travelers will love the studio staterooms, with 100 square feet of living space and a virtual window. Inside staterooms measure at 135 square feet and boast a sitting area and TV. For views, opt for an Ocean view stateroom, measuring between 160 and 372 square feet, or go even further with a balcony stateroom, for floor-to-ceiling glass doors and your own private sunspot. If you really need to unwind, the Spa Balcony or Spa Suite offer complimentary access to the spa and fitness center, and the suites feature an oversized waterfall shower. Tucked away on top of the ship you’ll find the most luxurious staterooms. These suites all come with 24-hour butler service and a private sun deck. Offering the ocean’s best selection of eateries, Norwegian Bliss won’t let you go hungry. Enjoy live music and traditional fare at the Texas Smokehouse, or sample fresh, local seafood at Ocean Blue. You’ll find chic, Tuscan dishes on offer at La Cucina, and the best meats going at Cagney’s steakhouse. Tepanyaki offers live entertainment alongside Japanese cuisine, and if that weren’t enough choice, you’ll also find French food, Mexican, handmade chocolates and fine dining on board. When night falls, watch a Beatles cover band play in a replica of the legendary Cavern Club, or catch Broadway’s Jersey Boys. Laugh your socks off at the comedy club, or enjoy a few open air cocktails. There are plenty of dining options to keep you entertained, and the two-story Horizon lounge is the perfect place to watch the sunset. Don’t miss the prohibition-era musical Happy Hour, with its eye-catching costumes and memorable tunes. There is no formal dress code onboard, and resort casual attire is fine.